There was an attorney. And champagne. And after a 20-year marriage, a breakup. Of course, because that’s what always happens at at times like this, the neighbors started to gossip. 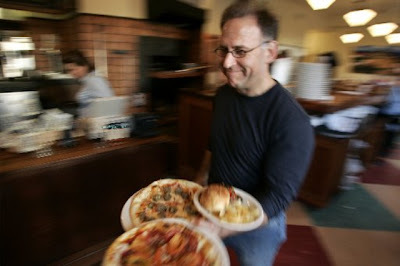 But Peter Levy and Jeremy Hardy just went about their business — a business that until this month included joint custody of six kids: Queen Anne’s 5 Spot (opened in 1990), Capitol Hill’s Coastal Kitchen (1993), U-Village’s Atlas Foods (1999), West Seattle’s Endolyne Joe’s (2003), Ballard’s Hi-Life (2004) and their latest, Mt. Baker’s Mioposto (2006). And now comes the announcement that the neighborhood restaurant kingpins are splitting the sheets: Excel spread, that is. In the settlement, Levy retains the business name Chow Foods and with it, the 5 Spot, Endolyne Joe’s, the Hi-Life and that sprawling mall-brat Atlas, while Hardy hightails it with Coastal Kitchen, Mioposto and a new corporate name — Seattle Eats. So, why are these regular Joes still smiling? Because “We’ve been best friends over 30 years,” says Hardy. “And we’ll be talking to each other for the next 30, continuing our conversation.” That conversation started in the ’70s when the pair met at T.G.I. Fridays in Portland, and continued at Portland’s McCormick and Schmick’s where they tended bar. Next thing you know, they were moving on up to Seattle, running a busy little diner — and eventually a corporate entity known as City Restaurant Group, later renamed Chow Foods. The partnership, now torn asunder, once knew great joy, including years when there were lines out the door for their first “baby,” born in 1988: Wallingford’s Beeliner Diner. Known for its sassy slogan, “Eat it and beat it!” the tiny Beeliner was the start of something big. It later grew into a vaguely troubled teen, Jitterbug (1996), before being sold (in 2005) then sold and renamed again, and again. Eat it and beat it, indeed. 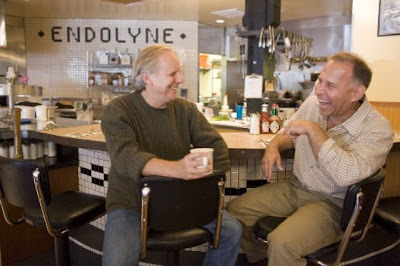 Levy and Hardy also suffered the sad loss of an infant, Luncheonette #1, a mid-town marvel whose birth (1994) and death (a year later) cemented the notion, “If it ain’t a neighborhood, we don’t want to live there.” Something disproved, to a certain degree, when the mall-brat made its debut.